I’ve just posted a report of the RWAust. conference over on the Word Wenches, but I wanted to post more photos of the fabulous costumes that people wore to the cocktail party that always kicks off our conferences. 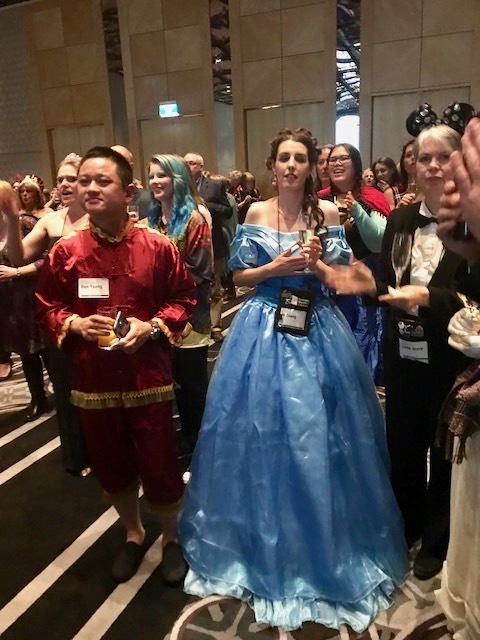 We always have fun, and there were so many brilliant costumes that I couldn’t fit on the wench blog, so I brought them here. Even so, this is only a small proportion of them. 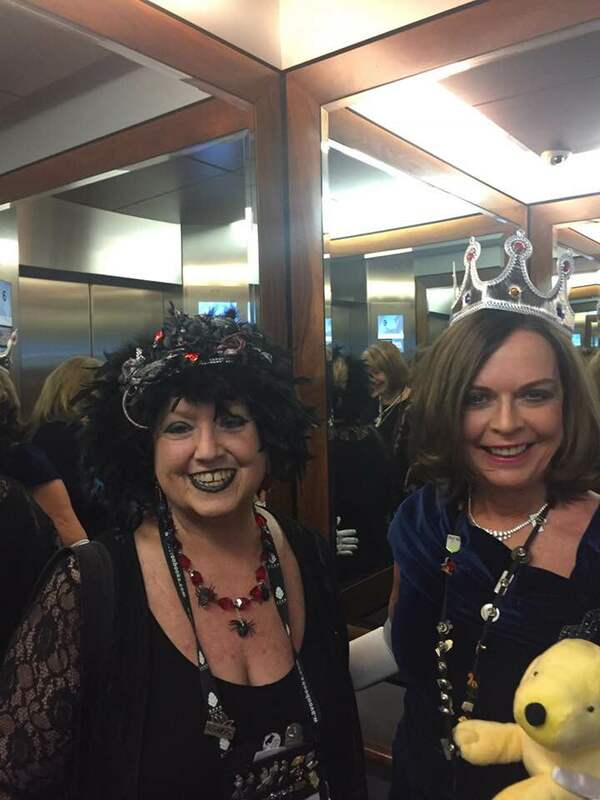 This year it was a “royalty” and “Tuxes and Tiaras” theme as the conference hotel is one where royalty has stayed when in Sydney — including Prince Charles and Princess Di when they were still together. But people riffed off that theme in all kinds of great ways — from the glamorous to the silly. Guess what direction I tend? 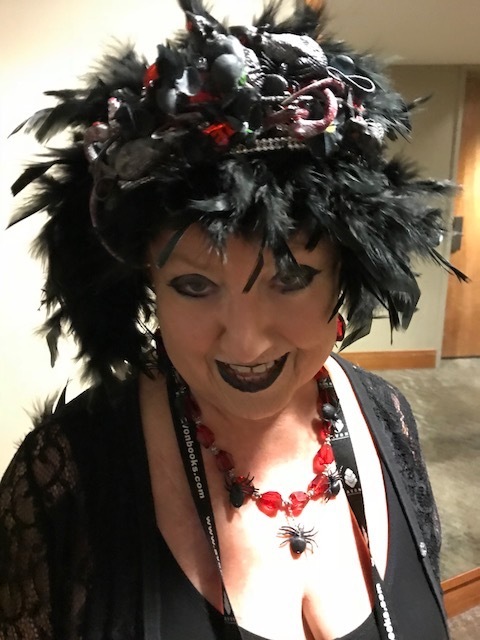 Yes, so this is me, in my evil queen outfit — the tiara is a cheap one onto which I glued rubber rats, snakes and spiders and “jools,” I made the necklace as well, so those spiders are attached. 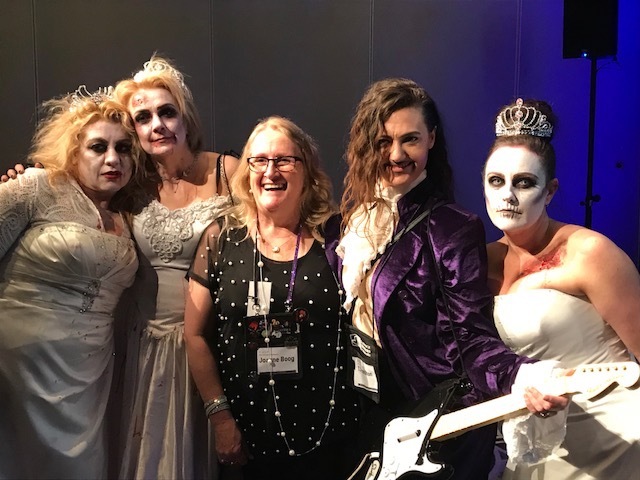 The three zombie brides below (Clare, Tanya and Kerry) won a prize for their outfits, as did “Prince” (TJ Hamilton) and in the middle is the new RWAust President, Joanne Boog. 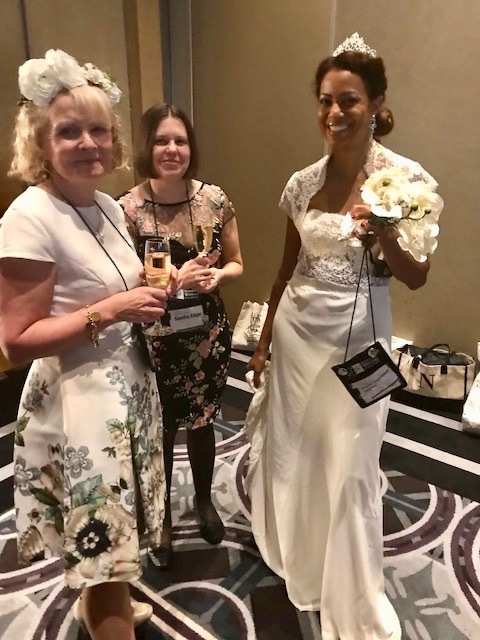 Not everyone dresses up, and that’s fine — this is about fun, not pressure, and in this pic we have a gorgeous bride in her own wedding dress, a “lady-in-waiting” kind of outfit, or maybe she’s dressed for a garden party, and someone who is dressed up gorgeously but not in costume as such. And they all look beautiful. 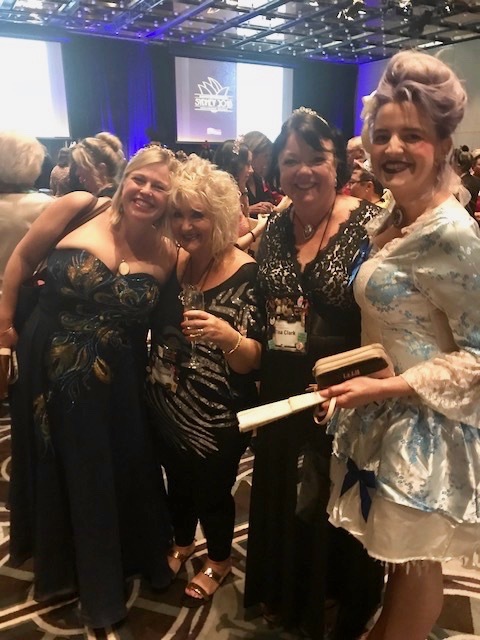 Here’s two agents and two authors , looking very glam and gorgeous. And here’s a lineup of authors, including one from the USA and one from New Zealand. And believe it or not, that redhead in the middle claimed to be Megan Markle. LOL. Here’s a snap of the crowd — and don’t you love that a member of Chinese royalty is represented, as well as someone possibly from Queen Victoria’s court? Here’s a little piece of pure glamor and good taste. 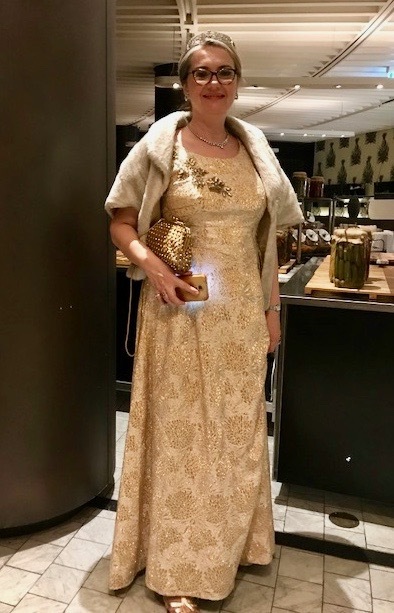 Doesn’t she look gorgeous? Definitely a visiting royal, possibly from a Scandinavian country. 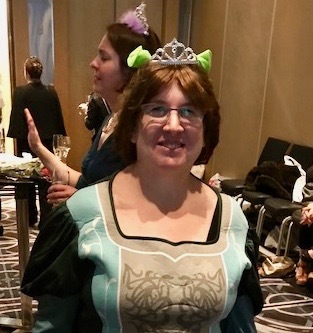 And what royal gathering would be without Princess Fiona, (Fiona Marsden) who this weekend took out a positive fistful of prizes, including the NZ Koru, the RWAust Emerald — twice! — and I don’t know how many more. Congratulations Fiona. 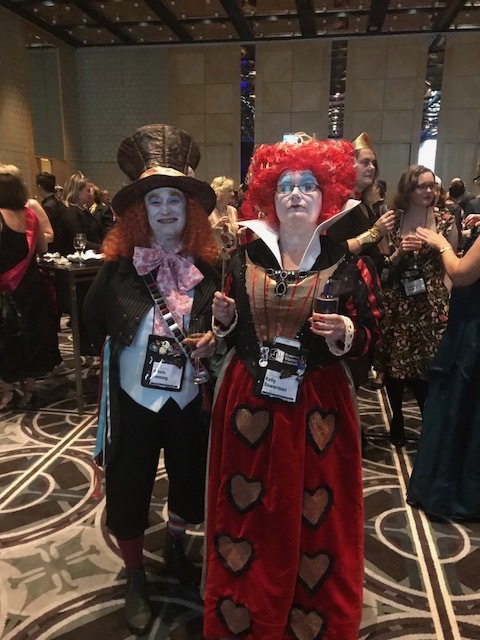 Below her is a fabulous couple stepping straight out of Wonderland — the mad hatter and the Queen of Hearts, looking scarily in an “off with her head” kind of mood. And what a brilliant riff off the “royalty” theme. There could so easily have been a whole tribe of Princess Di’s — which would have been hilarious — but the variety and inventiveness of these costumes just blew me away. 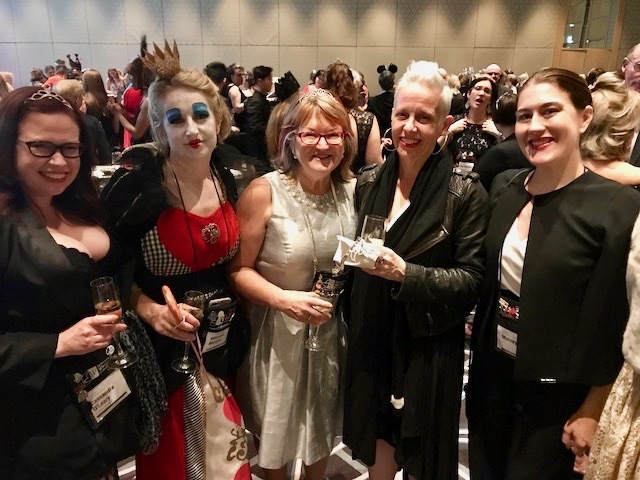 It was a brilliant party, so thanks to Harlequin for sponsoring it, to the RWA conference committee who organized it, and to all the wonderful people who attended, making it so much fun.